I have been rather alarmed by a debate that is going on in the blogosphere, books, emails and my conversations with beekeepers - Can Honeybees Turn Sugar into Honey? 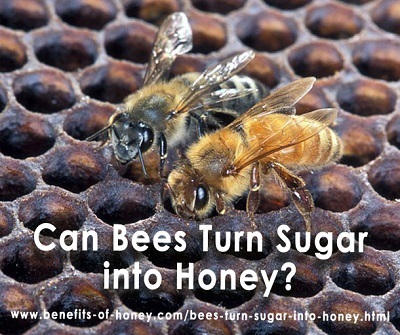 It appears that many beekeepers all over the world are feeding their bees with sugar water. I have no idea how big the number is and I also wonder if they truly believe that bees could turn sugar water into honey, they are just deluding themselves with their fake honey, or they are trying to trick consumers into believing that the product of their sugar-water fed bees is no different from the floral nectar processed and produced by bees. Well, I understand why some beekeepers feed their bees with sugar water during the winter period when the bees could not find enough flowering trees and plants. Sugar water is used as an emergency food to help the bees survive when there is little or no nectar flow. Under such circumstances, these beekeepers do not harvest and sell the honey, simply because there is already not enough food for the bees and also the quality of the honey will not be the same. Calling what the bees' make from sugar syrup honey is an ethical issue. The beauty of honey lies in the fact that it comes in various floral varietals, in different colors, hues, flavors and nutritional content that are all determined by the different types of flowers the bees visit for nectar. If the bees are not getting enough food in an environment where there is no or inadequate nectar flow throughout the year, then they are kept and existing in the wrong place. They should not be kept in the first place! In fact, if sugar water was really essential for the honeybees' survival, how did the bees thrive thousands of years ago when refined sugar didn't exist? As defined by the National Honey Board, honey is "the substance made when the nectar and sweet deposits from plants are gathered, modified and stored in the honeycomb by honey bees". This clearly stipulates a bee product that does not allow the addition of any other substance or adulteration of the product. Well, the bees are probably able to produce something from sugar water but it wouldn't be real honey. Legally this syrup is not honey. The nutritional make-up would be different from real pure, unadulterated honey. I am curious to see laboratory analyses on the chemical composition of nectar honey (from bees that eat only honey) and non-nectar honey (from bees that are fed with sugar water) and a comparison of the both. It would be jaw-dropping if there isn't any difference in their nutritional content. It's common sense for anyone to understand that it's not good and natural for bees to feed on sugar water. Honeybees exist and survive as pollinators of trees and plants on our earth. Feeding them with sugar all the time and making them dependent on sugar water just does not sound right. It does not help the honeybees to exist normally and naturally, to be what they are supposed to survive on, how they are supposed to behave, what they are supposed to eat, and all these could adversely affect their behaviour, health and biology. Are you now wondering what's in your jar that is labelled honey? The media has reported that many lab tests showed a lot of honey in the grocery stores was not real honey. Honey that did not contain bee pollen failed these tests, whereby pollen is believed to be the only foolproof fingerprint to a honey's source. Perhaps the reason why there's no trace of bee pollen in so much honey may not be just because of the ultra-filtration process that removes all microscopic particles in the honey. Possibly, it could also be due to the fact that the bees are feeding only on sugar water. So, get your honey direct from trusted beekeepers who can explain to you how their bees are kept, their food source, and how their honey is harvested. If that is not possible in where you live, then get your honey from a trusted brand that is transparent about their source of their honey and takes pride in supplying real honey with all its vitamins, flavonoids, amino acids, protein, minerals, and pollen. End of "Can Bees Turn Sugar into Honey?". Back to "How do bees make honey?" Postings on Can Bees Turn Sugar into Honey? Note: Please give your post some time to be published. Our system has to first monitor and weed out spammy posts. Only posts relevant to the topic will be published. Posts smeared with swearing and flaming are not welcome. I am a six year top bar beekeeper. I do not believe in feeding my bees sugar water, pollen patties, etc. Many points in this article are completely aligned with my thoughts on this matter. I actually feel that this is part of the reason for the bees collapse. You should never rob the bees of their stores and have to supplement them with sugar water or pollen patties. You are completely greedy if this is how you operate. My belief is that modern beekeeping practices are as much to blame as pesticides and loss of habitat. Would love to discuss how we can prove this and come up with a plan to educate and advocate. I am a beekeeper. I stumbled upon this thread because I was interested in determining whether bees (which I may feed with sugar from time to time - when absolutely necessary) do actually convert table sugar into another type of sugar. I've found nothing that answers this question to this point. However to respond to some assertions on this thread, from my experience, you can rest assured that most beekeepers would not knowingly sell honey which has bees adulterated with sugar. Beekeepers sometimes do feed sugar to bee colonies which may have insufficient stores of honey so they can survive the winter. It is not economic, nor ethical to feed sugar to bees so that they make a sugary kind of honey out of it. That is not to say that some unscrupulous purveyors of so-called honey might not adulterate honey with sugar, but if that was done it would make no sense to feed it to the bees. Rather, sugar would be mixed with perhaps honey as it is cheaper than real honey. I know of no beekeeper who would do this. Most all of my fellow beekeepers are interested in the survival of pollinators and want their bees to thrive and produce a quality honey. There you have an answer from a beekeepers perspective. A comment on feeding bees sugar water--that is so common it may be universal. Sugar water is fed to the bees if their honey stores are low (for sure--whenever a new hive is started) and when they're working on their brood boxes--if stored, it is basically stored as sugar water. When it's time to put the honey supers on, the feeding stops and the bees make honey from just what they harvest. No self-respecting beekeeper would sell sugar water as honey and would never have the honey supers on the hive while feeding..
Not only that but if bees are taking sugar water instead of flower nectar it means less pollination of plants affecting the entire eco system... Oh when will human beings live in a manner of love and harmony for the whole and the magnificance of nature which is designed to sustain us... Instead of monetary profit at the expense of everything else.. Sometimes I am ashamed to call myself human! A well prepared informative article. Thank you. Gee, don't be so quick to cut and slash at anyone who seems to dislike the idea of feeding sugar to bees. Yes, you are right that I know nothing about beekeeping because I am not a beekeeper. But I love honey, so I'm raising my concerns as a consumer. If you are selling honey from your sugar-fed bees, you can't be thinking just for your bees and your livelihood, spare some thought for your customers. You need to understand how they feel. We don't eat honey just because it's sweet. If you are not selling the honey, then it's a different matter all together. Read carefully, this page is not meant to criticise beekeepers who are feeding their bees with sugar, but beekeepers who believe that the "honey" made by their sugar-fed bees is the same as (i.e., as good as) the honey made by floral nectar-fed bees and want their customers to believe the same. Ok, while trying to stay calm I'll tell you that you need to learn a lot more about honeybees before you write articles like this. 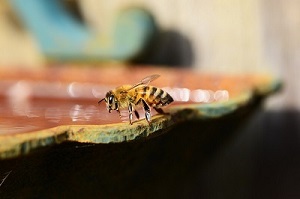 There are many valid reasons to feed honeybees sugar water. Also there are many beekeepers that don't know how or when to use supplemental feeding correctly. Please don't judge all honey or all beekeepers by what you "think" you know. End of Interview. Back to "Can Bees Turn Sugar into Honey?"